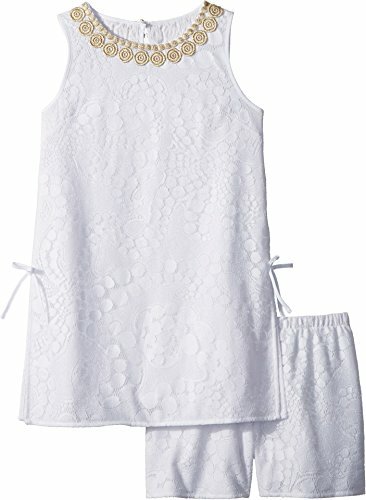 Lilly Pulitzer Infants Size Guide Lilly Pulitzer Girls Size Guide What's cuter than the Lilly Pulitzer® Kids Mini Donna Set? Practically nothing! Two-piece set features a shift-style tunic top with coordinating shorts, both crafted from a solid mocean lace fabrication. Round neckline with a gold lace appliqué. Keyhole opening and button closure at the nape. Sleeveless styling. Pre-tied bows sit atop the side slits. Straight hemline. Pull-on shorts boast an elastic waistband and a slim fit. 75% cotton, 25% polyamide;Lining: 65% polyester, 35% cotton. Hand wash cold, lay flat to dry. Imported. Measurements: Length: 26 in Waist Measurement: 23 in Outseam: 11 in Inseam: 2 in Front Rise: 9 1⁄2 in Back Rise: 12 in Leg Opening: 10 in Product measurements were taken using size 10 Big Kids. Please note that measurements may vary by size. What's cuter than the Lilly Pulitzer® Kids Mini Donna Set? Practically nothing! Two-piece set features a shift-style tunic top with coordinating shorts, both crafted from a solid mocean lace fabrication.